1953 March 12 Order for 2 XF-104 prototypes placed with Lockheed. 1954 March 4 First XF-104 (53-7786) makes first flight, Lockheed chief test pilot A.W. "Tony" LeVier at the controls. Yeager said of the F-104 "They've done an excellent job mounting it". explosion during a firing burst). 1956 February 17 First YF-104A (55-2955) makes a highly successful first flight. Lockheed test pilot Herman "Fish" Salmon at the controls. 1956 August 27 The first NACA F-104 (55-2961) flown by NACA research pilot Joe Walker takes off from the NACA High Speed Flight Station facility (now the NASA Dryden Flight Research Center). 1958 January 16 The F-104B's first flight took place on 16 January 1957, less than a year after the two-seater's first mockup inspection. 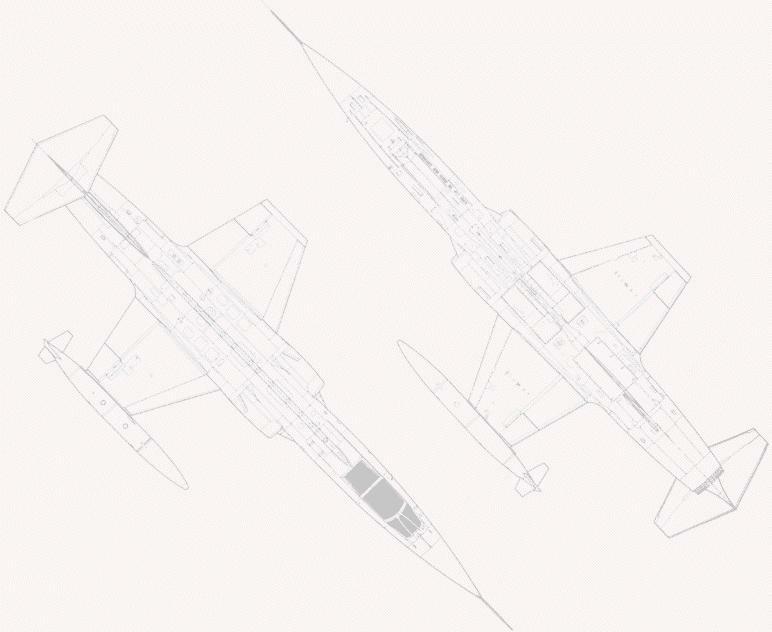 The first of an initial batch of six F-104Bs (serial number 56-3719) had been literally built by hand out of an F-104A airframe, and the larger area vertical tail, the automatic pitch control system, and the fire control system of later F-104Bs were not installed. It was unofficially designated YF-104B, although it was later brought up to production F-104B standards. This airplane was later used to test Lockheed's downward-firing ejection seat that was initially fitted to the F-104A. 1958 February 20 83rd Fighter Interceptor Squadron operational as the first F-104 fighter squadron in the world. in YF-104A "FG-957", serial number 55-2957 at Edwards AFB, Palmdale, CA (USA). 83rd Fighter Interceptor Squadron in YF-104A serial number 55-2969 "Speedy" at Edwards AFB. of 27,813 meters (91,246 ft) and the world speed record of 2.259 km/h (1.404.19 mph). 1958 September 11 12 F-104A of 83rd Fighter Interceptor Squadron were stationed at Tao Yuan AB, Taiwan during the Quemoy Crisis. 1958 September The first three F104C to TAC 476th TFW were delivered in late September 1958. They were: 56-883, 56-884 & 56-887. The first operational squadron was the 476th TFS "Blue Knights" of the 479th TFW at George AFB, CA. 1958 October 16 The first C-model accepted by Tactical Air Command at the annual fighter weapons meet at Nellis AFB in Las Vegas, Nevada. This aircraft was named "Really George" because its home base would be the 479th TFW at George AFB, California. Secondly it would be the plane flown by Wing Commander Col. George Laven Jr.
and Einar K. Envoldson of the 538th Fighter Interceptor Squadron at Larson AFB, WA. - 3000 meter time-to-climb record in 41.85 seconds. - 6000 meter time-to-climb record in 58.41 seconds. - 9000 meter time-to-climb record in 81.14 seconds (1 minute 21 seconds). - 12,000 meter time-to-climb record in 99.90 seconds (1 minute 39 seconds). 8 minutes 59.9 seconds. Average speed 1850 km/h. Performed by Captain M. Schaff, USAF; Captain B. Jones, USAF. reaching 25.000 m (82,020.8 ft) in 4 minutes 26.03 seconds. The Starfighter was the first aircraft to hold simultaneous official world records for speed, altitude and time-to-climb. 1959 December 14 First flight over 100.000 ft to 31,513 m (103,389 ft) world altitude record by Capt "Joe" B. Jordan in F-104C serial number 56-0885 at Edwards AFB. Time-to-climb record to 30,000 m (98,424 ft) from brake release in 15 min 4.92 sec. This was the first aircraft taking off on its own power to reach the 30,000 m and 100,000 ft altitude. 1960 October 5 1st flight of F-104G at Lockheed factory, Palmdale, California (DA+101 construction number 2001). 1961 1st flight of Canadian CF-104 May 26, 1961 (RCAF serial number 12701, built by Canadair, at Palmdale). 1st flight of Belgium F-104G August 3, 1961 (construction number 683D-9001, build and tested by Lockheed, Palmdale). 1st flight of Japanese F-104G August 26, 1961 (JASDF serial number 26-8501, build and tested by Lockheed, Palmdale). 1st flight of Italian F-104G December 11, 1961 (construction number 683-9998, serial number MM6501, tested by Lockheed, Palmdale). 1961 November 25 First CF-104 crash (12702) during a test flight from Canadair. Pilot ejected safely. 1962 Here's a statement to Lockheed from Capt. Charles E. Tofferi, 479th Tactical Fighter Wing, who flew his F-104C to the 1962 William Tell Fighter Weapons Meet title: "Thank you, one and all, for the best airplane I've ever flown." He said the F-104 "really shines" in maintenance capability, "so simple to maintain, people with little experience can do it." 1962 May 22 First crash of CF-104 in service (12707), near Namao, Alberta. 1963 April 12 Jacqueline Cochran averaged 1.273,10 mph (2,048.88 km/h) over a 15-25 km straight line course, she reached Mach 1.94 and beat her own record for the distance with TF-104G N104L demonstrator "Free World Defender" (cn 5702). FAI (Fédération Aéronautique Internationale) Record File Number #13042. 1963 April 18 BAF: FX04 delivered from SABCA as 1st F-104G to 350 sqn of 1 Wing Beauvechain AB (pilot: Lt.Col. Cailleau, CO Flying 1 Wing). 1963 April 19 BAF: FX04 first official F-104G flight from Beauvechain AB (pilot: Maj. Marcel Legrand, CO 350 Squadron). 1963 June 6 record flight Brussels-Paris (Le Bourget) 260,6 km in 9 minutes 55 seconds, average speed 979.55 mph or 1,576.435 km/h; Bernard A. Neefs, Chief Test pilot SABCA-Fairey, flown with FX11. 1963 November 15 The first NF-104A serial number 56-0756 flown by Maj Robert W. Smith set an unofficial world altitude record of 118,860 feet for aircraft taking off under their own power at Edwards AFB. The official record at that time was 113,800 feet, set by the Mikoyan/Gurevich Ye-66A, an experimental version of the MiG-21 Fishbed (Ye-66A : Built to break the world altitude record). Ye-66A 34,714 meter April 28, 1961. 1963 December 6 NF-104A serial number 56-0756 flown by Major R. W. Smith reached an altitude of 36.820 meter (120,800 feet). unofficial record for altitude, the Air Force had not requested certification in advance so no FAI personnel were on site to certify the flight. One of the TF-104G Model 583Ds was retained by Lockheed as a demonstrator. It carried the civil registration number N104L and was nicknamed *Free World Defender*. It was used by the well-known aviatrix Jacqueline Cochran to set three women's world's speed records. On May 11, 1964, she averaged 1429.3 mph over a 15/25 km course, on June 1 she flew at an average speed of 1303.18 mph over a 100-km closed-circuit course, and on June 3 she flew at an average speed of 1127.4 mph over a 500-km closed-circuit course. Ms. Cochran's Model 583D was eventually delivered to the Koninklijke Luchtmacht (KLu) with the Dutch serial number D-5702. 1964 June 25 Dutch height record: Dutch Capt Wiebe Pot flew from Leeuwarden the very first Dutch zoom flight in an F-104G Starfighter. It was D-8115 (323 squadron) in light grey scheme and he reached an unofficial Dutch height record of 62.000 feet. 1964 fall First pilot to fly 2000 hours in the F-104 aircraft was Maj Robert E. Messerli. That was in the fall of 1964. 1966 June 8 F-104N N813NA collided with North American Aviation XB-70A Valkyrie 62-0207 and exploded. During a publicity photo formation flight, a NASA F-104N Starfighter, N813NA, flown by NASA test pilot Joseph A.Walker, was caught in the wingtip vortices of the North American Aviation XB-70A Valkyrie, s/n 62-0207, the second prototype Mach 3+ strategic bomber. The Starfighter rolled up and across the Valkyrie. The two airplanes collided, with the F-104 taking off the Valkyrie’s vertical fins, then exploding. The B-70 pilot, Al White, was able to eject. Walker and B-70 co-pilot Major Carl S. Cross, USAF, were killed. 1966 September 30 First completion of 100 combat missions over North Vietnam in the F-104C by Capt Harold Alston, 435th TFS 479th TFW George AFB at Udorn Royal Thai Air Base on September 30, 1966, serial number 57-0928. 1966 September 30 Completion of 1.000 combat missions over North Vietnam in the F-104C, flown by Capt Mike Korte, 435th TFS 479th TFW George AFB at Udorn Royal Thai Air Base on September 30, 1966. 1966 November 3 JASDF F-104J 76-9699 dashes from Tokyo to Osaka (395 km) in 10 minutes and 21 seconds (max speed 2.290 km/h). 1967 November 8 Dutch zoom flight: Capt Henk Krauss from 322 or 323 squadron got a new record when he zoomed over 70.000 feet; sadly no exact height is known and also no serial of the involved Starfighter. 1968 March 28 Belgian zoom flight: Official record of 82.500 feet flown by Cdt Ludo Forgeuer (350 squadron) with FX01. 1969 March 7 Major G.R. “Bob” Ayres became first Canadian Forces Starfighter pilot to attain 2.000 hours. 1976 August 26 record flight Aviano-Trapani-Birgi (911 km) in 43 minutes 10 seconds, average speed 1268 km/h (Mach 1.19), max speed Mach 1.8 at 45000 feet, pilot Capt Aldo Rossi, F-104S MM6849 51-07 of 22°Gruppo. 1976 October 1 Belgian zoom flight: last stratospheric flight after a total of 478 „Zoom“-Climbs. The first flight was on April 30, 1967. 1977 October 24 Red Baron F-104RB Starfighter raised the world speed record over a 3 km low-level course at Tonopah, Nevada to 1,590.45 km/h (or 988.26 mph). 1983 February 17 5000th Martin Baker ejection seat recovery (Martin-Baker MB.IQ7A) with AMI F-104S MM6911 of 155 Gruppo coded "51-45". 1991 July 16 100.000 flight hours by 102°Gruppo of 5°Stormo (AMI) at Rimini AB with F-104S ASA MM6744 "5-07", flown by LtCol Mario Tassini. 1994 January 31 "NASA 826" last research mission on January 31, 1994. The other remaining F-104, NASA 825, was flown on its last research mission January 24, 1994. 1994 February 3 Final flight of a F-104 at Dryden, a symbolic farewell with NASA 826, piloted by Tom McMurtry, Chief, Flight Operations Division. First acquired in 1956, 11 F-104's flew at Dryden over a 38-year period as chase and research aircraft. 1994 June 5 Last AMI F-104G flight MM6589 "4-49" at Grosseto AB, pilot Squadron leader Lt Col Fabio Landi, 4°Stormo 20°Gruppo. Before F-104s' retirement, the 12th TRS was the sole F-104 operator, and the unit was relocated from Tao Yuan AB to Hsinchu AB. The last two operational ROCAF Starfighter, TF-104G 4186 and 4196, departed Hsinchu for CCK on May 8 for the ceremony. 2002 February 4 Last F-104 modified to ASA-M version delivered to the AMI on February 4, 2002, taken on charge by the 10°Gruppo coded "9-50". 2004 March 25 F-104S ASA-M MM6930 made the world F-104 single flight hours record with 2.50 hours without air refueling. 2004 May 30 50th anniversary of the Starfighter "Raduno Mondiale F-104" (World Meeting), Pratica di Mare, Italy, 29 and 30 May 2004. 2004 October 31 AMI last operational flight: F-104S ASA-M MM6850 4-16, MM6876 9-39, MM6890 4-50, MM6930 9-99, MM6934 9-31. 2005 July 27 AMI last military flight: TF-104G-M MM54260 "RS-08" of 311°Gruppo of RSV after 42 years of servive in Italy. 2014 November 14 Wolfgang Czaia flew a mission for the Starfighters Inc. With this flight he became the pilot with the longest operational F-104 pilot period ever. CF-104 - N104RN.